Call Your Mother opened its doors in D.C.'s Park View neighborhood in October, and the crowds have not subsided. Why is the city going carb-crazy? Founder Andrew Dana talks to WTOP about opening D.C.'s most in-demand bagel shop. WASHINGTON — When Andrew Dana first started working on the concept for Call Your Mother, a Jewish-inspired deli that opened in October in D.C.’s Park View neighborhood, he imagined it would be “a semi-sleepy” neighborhood bagel shop that drew a small crowd on the weekends. “I wanted to create a bagel shop that could be here for generations,” said Dana, who is also the co-owner of Timber Pizza Co., Bon Appétit’s 2017 pick for Pizzeria of the Year. However, Dana’s plans didn’t pan out. And after months of successfully “testing the market” by selling wood-fired bagels to the masses at local farmers markets, he should have known the end result would be anything but sleepy. “We basically had the door blasted open. From day one, we’ve had lines out the door and halfway down the block to the alley,” Dana said. To crank out the 3,000 bagels Call Your Mother sells on the weekends, the shop’s hot-pink brick oven gets started around 3 a.m. and doesn’t catch a break until the afternoon. Even weekdays are busier than Dana expected, especially since the corner deli is surrounded by row homes, not office buildings. “I guess a lot of people work from home in this area or take long lunch breaks — we don’t really know,” Dana said. The warm welcome from carb-crazed Washingtonians might lead some to believe that Call Your Mother is the only bagel shop in town. That is not the case. But Dana said the concept, led by chef Daniela Moreira, also of Timber Pizza Co., does fill a void in D.C.’s food offerings. “The city was ready for a bagel shop that was done in sort of a new, creative way,” he said. The menu at Call Your Mother has the staples customers expect from a deli: smoked fish, black and white cookies, and a selection of smears. But there’s also a bagel filled with apple cream cheese, apple bacon, jalapeño and chips. “It’s crunchy, it’s salty, it’s sweet, it’s spicy, it’s got the fat from the bacon — it’s definitely weird, but it’s also dope,” Dana said. The matzo ball soup has a South American twist, and diners can sub in pastrami for bacon on the classic egg-and-cheese bagel sandwich. Then, there’s the Amar’e, which features candied salmon cream cheese, crispy shallots, cucumber and microgreens on a za’atar bagel. “It’s close enough to a classic bagel with salmon and cream cheese, but creative enough that it’s different and new, and that one has been really popular,” Dana said. The deli’s pink and green décor — which Dana describes as Boca-meets-Brooklyn, with “bright and tight and South Florida vibes” — is just as playful as the menu. Even the coffee is a twist on what’s commonly found in other cafes throughout the city. Dana said he wanted to serve “just coffee” at Call Your Mother, not an “over-the-top” craft brew that tastes like “fruit juice.” So he tapped the team at Lost Sock Roasters to make it happen. “And I took them on a field trip to 7-Eleven and I said, ‘Make this, but good,’ and they were highly offended, but then they executed it, and it’s bomb. It tastes like coffee,” Dana said. 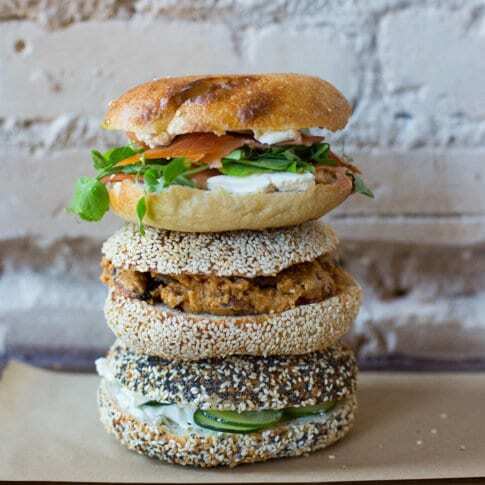 Those anxious to try Call Your Mother’s mash up of Montreal- and New York-style bagels without a line will soon be able to find them in a select cafes, markets and restaurants around town. Dana is currently working on wholesale operations, as well as plans to host more communal dinners, dubbed supper club, in the breakfast and lunch-only deli. Call Your Mother is located at 3301 Georgia Ave. NW and is open Tuesday through Sunday from 8 a.m. to 2 p.m.